What is Special about Harringtons Rich in Turkey with Veg? Kelp – a natural source of vitamins, minerals and trace elements. Yeast to help maintain a healthy digestion. With Turkey, a good source of protein. Citrus extracts and added vitamins help support a healthy immune system. Balanced ratio of Omega 6 & 3 fats for a glossy coat. Yucca to help reduce unpleasant odours from flatulence. 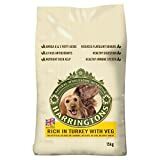 This entry was posted in Uncategorized and tagged 15kg, Complete, Harrington's, Turkey, Vegetable by One Boutique. Bookmark the permalink.